Jacques Audiard has announced himself as the most reliable creator of tough, visually beautiful, emotionally nuanced films set in a gritty and socially deprived contemporary France. And DHEEPAN is his best movie to date. It tells the story of Deepen - a Tamil tiger who flees Sri Lanka under the guise of being a family man, with a wife and daughter - in reality utterly unknown to him and each other - in tow. When they reach Paris he becomes one of those annoying street pedlars, and then thanks to a helpful translator at the immigration interview, the “family” gets moved to low-rise apartment complex on the edge of town. Dheepan becomes the janitor, his “wife” Yalini cares for an elderly disabled man, and their “daughter” tries to integrate into a local school. For the first hour the film plays almost as a slow burn romantic drama as we see this family start to forge an actual relationship against a backdrop of petty drug dealing in the projects. 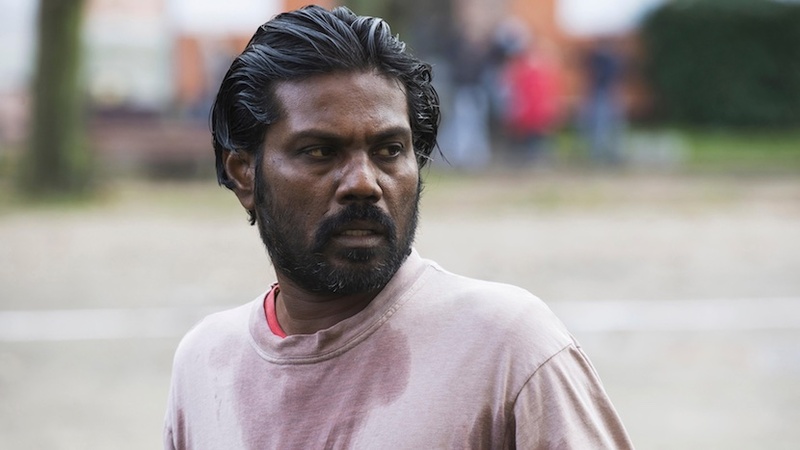 Dheepan turns out to be almost more gentle than Yalini, despite his violent background and is clearly smart to boot. But as we move into the second hour of the film we realise that leaving behind the traumas of the Sri Lankan civil war is easier said than done. As gang violence breaks out the position of the family becomes dangerous, cracks begin to form and old gut reactions take over. The resulting film is simply stunning. The two lead performances from Antonythasan Jesuthasan as Dheepan and Kalieaswari Srinivasan as Yalini are scarily convincing and sympathetic. Director Jacques Audiard (RUST AND BONE) has a visual style that is just stunning. From near the opening when Dheepan and his fellow street pedlars emerge from the darkness wearing lit headbands, to the delicately elegant scene in which a naked Yalini blends into the darkness, to the way in which he handles the action scenes through smoke and dust...You just know you're in the hands of someone who understands how to use the camera to convey pregnant meaning as much as plot and character. For me this is the film of the festival and arguably of the year, alongside CAROL, which is quite different in nature. But I suppose both, in a way, are concerned with the hidden lives of people that we normally wouldn't give a second glance - a shopgirl and a street pedlar. Both are deeply relevant to the social crises of today - from the gay rights movement to migrant issues. And both combine both deeply complex characters with a unique visual style. Both deserved the Palme D'Or but I can see why DHEEPAN just edged it. It's because there's a surprising discovery and unfamiliarity about this story and these actors that deserves to be showcased. DHEEPAN has a running time of 110 minutes. It played Cannes 2015 where it won the Palme D'Or, and also played Toronto. It opened in France in August, in Iceland and Sweden in September and opens in Italy on October 22nd, in Greece on November 19th and in Germany on December 10th.